Back in 2012, the city of Vladivostok, Russia opened a shiny new bridge over the Zolotoy Rog Bay to make life easier for everyone, and then in 2015 they stopped letting people cross it on foot. Now the people have had enough, and they’re taking action. There has been a lot of protest about the vehicle-only rules enforced on the bridge over the years, but as RT has reported, the government hasn’t budged, citing four suicide attempts and an unsafe width. 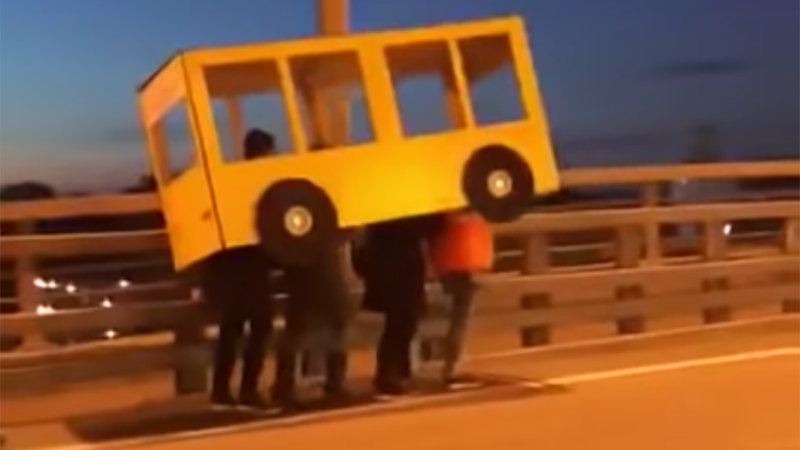 But the latest protest has come in the form of four people in a bus-shaped cutout. From what I can tell from the video taken by a very entertained driver, the brave and strong group made it pretty far before being chased down by someone and forced to turn around. I wonder what gave them away?